Red Blood Cell (Erythrocyte) under a microscope! FACTS: Red blood cells, or erythrocytes, contain the hemoglobin that carries oxygen and carbon dioxide around the body. (Erythro means red in Greek, and cyte translates to cell.) Hemoglobin gives red blood cells their characteristic color. When it is oxygen-rich, it appears reddish; when oxygen-poor, it is darker and bluish. A normal person can have more than 10,000,000,000,000 erythrocytes in their body! So don't fret if a few escape. And think about giving some away too. Donated blood can only be stored for six weeks and is constantly required to save the lives of accident victims and surgical patients, and to help manage chronic diseases. If you're healthy, you've got lots to spare. So have a heart – it's a bloody good idea! 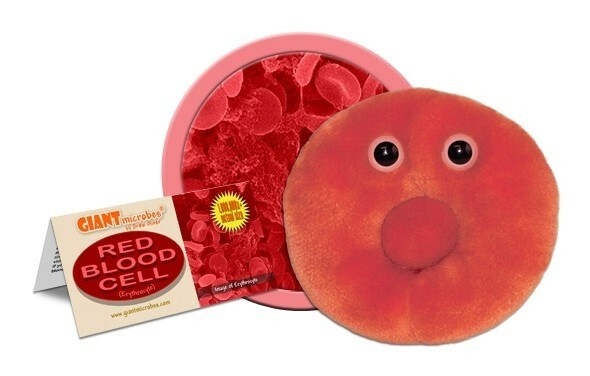 Red blood cells, also called erythrocytes, are flexible, red, biconcave discs. This structure provides the cell with ample surface area for the absorption and delivery of oxygen and carbon dioxide. The cells contain hemoglobin, a red protein that binds to the air so that it can be distributed throughout the body. Red blood cells, like white blood cells, are made in the bone marrow and circulate through the blood stream. This is a cute gift for that person who gets your blood flowing! 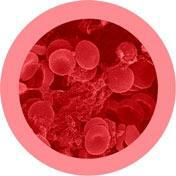 The name Red Blood Cells is derived from the appearance. 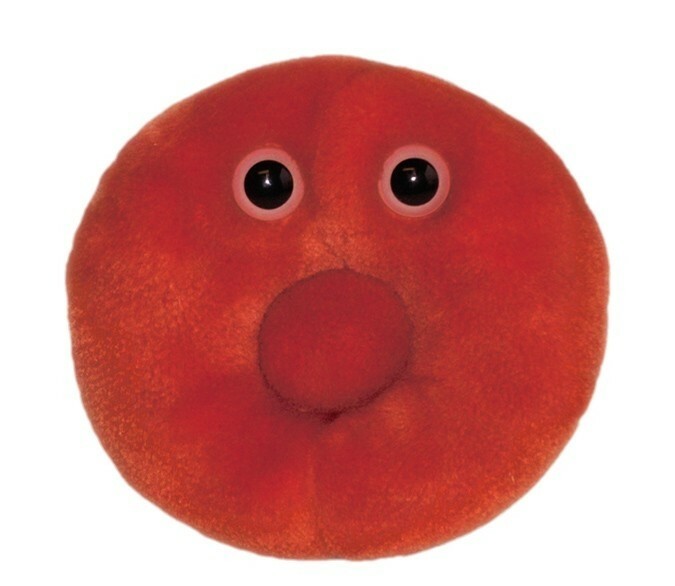 Erythrocyte comes from the Greek words: Erythros= red, Cyte= cell. The average diameter of circulating red blood cells is 8 micrometers, less than the width of a cotton fiber. Quantity:30 trillion red blood cells for men, 20 trillion for women. 1658: Jan Swammerdam was the first to see red blood cells under the microscope. 1695: Antoni van Leeuwenhoek described the size and shape of them. Incomplete cells: Mature red blood cells don’t contain a nucleus, and they are incapable of cell division. Life span: Approximately 120 days. They are replaced at a rate of 2.5 million per second.